On Thursday, October 19, 2017 at 7:00 p.m., the opening ceremony of the 2017-18 course and the graduation ceremony of the 2016-17 students was held in the auditorium of the ONCE building (Gran Via, 400 Barcelona) of the University School Mediterrani, center attached to the University of Girona. With an auditorium completely crowded the event was attended by more than 300 people among students, teachers, family of students and management of the center. 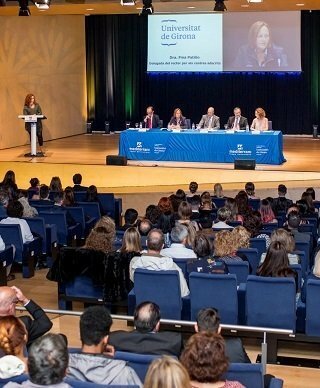 During the event see the presence of the Delegate of the Rector for Associated Centers of the UdG, Dr. Fina Patiño, who carried out the delivery of the “Mediterrani Award” to all Graduates in Tourism and Marketing. Then it was the General Manager of Mediterrani who delivered the awards to the CFGS graduates of the center. During the ceremony, the official language courses of Cambridge and the French Chamber of Commerce were also delivered, which EU Mediterrani include free of charge in all its university degrees. It is also worth mentioning the presentation of the “Entrepreneurial Award Mediterrani 2017” to the company specialized in accommodation RESA for its business excellence and cooperation with the academic community. The event ended with a crowded cocktail.